Haven’t heard of Power Editor? It’s a complimentary tool provided by Facebook that can be downloaded at the click of a button. If you manage multiple Facebook accounts or campaigns for your nonprofit, Power Editor might become your new bud, making it easy to create, edit, manage and optimize multiple ads at once. Using Power Editor, you can create a Facebook ad that targets your current donors by importing your list of emails for active donors. Use the Google Chrome Power Editor in Google Chrome extension. If you don’t have Google Chrome installed on your computer yet, you can download Chrome here. 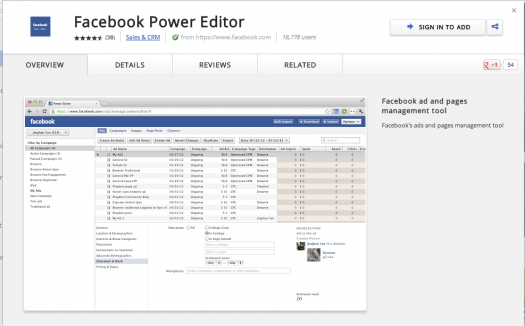 Install Power Editor by clicking here or going through Facebook’s Ad Manager. After you install Power Editor, a new browser tab will automatically open up: Click on the Power Editor icon on that tab to begin launch. If the tab doesn’t open up, learn more. Are you using custom audiences yet? Let us know about your experience!